Encores! revives a 1950s political satire, but its contemporary relevance is lacking and it isn’t much fun, either. Lane Williamson reviews. In a pre-show curtain speech, artistic director Jack Viertel said one of the reasons Encores! brought back Call Me Madam, the first hit for the company in 1995, was to see how a political satire written in 1950 would play in 2019. From an early comedy number where the titular madam, Sally Adams, bridges the partisan divide through, I kid you not, a square dance, it became clear that the lighthearted goofiness of Call Me Madam’s political climate would have nothing to do with ours and that whatever politics it satirized would be unrecognizable in our present day borderline dystopia. Well, that’s not entirely true. Sally Adams, whose only qualifications are that she has an oil fortune and can throw a mean party, is appointed ambassador to the fictional duchy of Lichtenburg. In being woefully under-qualified, Adams does bear some resemblance to appointees in the current president’s cabinet. The difference is that Sally Adams is harmless and well-intentioned. For better or worse, Call Me Madam is intrinsically linked to Ethel Merman. The show was written for her, she won a Tony for it, and she reprised her role in the film adaptation three years later. As is often the case with Merman’s material, her heavyweight voice becomes as much a part of the orchestration as the trombones and clarinets; even when she’s not singing it, it echoes through the vocal lines. You can hear how the composer, in this case Irving Berlin, structures the melodies to pay off with the kind of muscular, reverberating notes that defined Merman’s style. Berlin and Cole Porter in other shows have these money notes repeated over and over in Merman’s signature numbers, sometimes modulating, but often just staying where they are, offering the listener a chance to hear that pulse-stopping tone as much as possible. 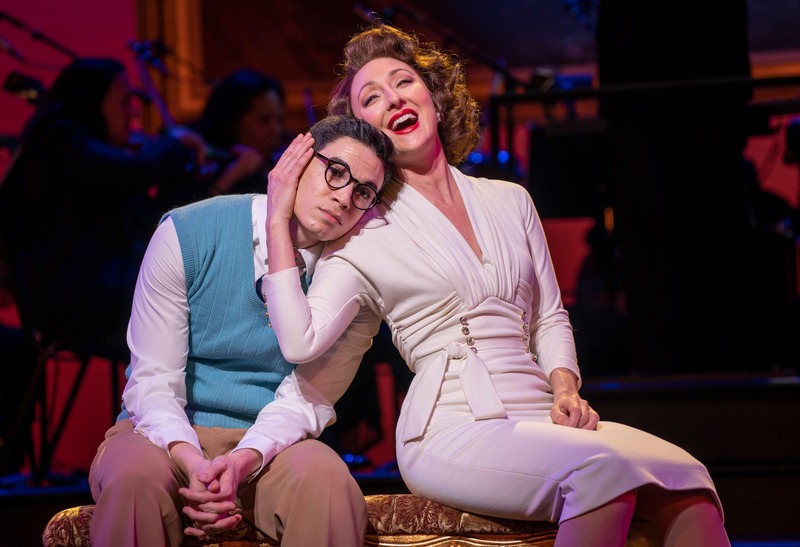 This happens everywhere in the score of Call Me Madam and though Carmen Cusack is one of the most talented actors currently working in the musical theatre, her voice is not suited to the Merman style. The shades of Cusack’s distinctive soul-baring tone are at odds with the squawking brass of Berlin’s music. The broadness of her voice, employed so effectively in Bright Star, here seems constantly outside the world of the orchestra, like she is in another room trying to get in. If the voice doesn’t have the requisite quality to bring the songs fully to life, she compensates for it with a charismatic performance that finds an effortless humor in the dialogue. Where Cusack succeeds is in painting Sally Adams as a woman who does not accept obstacles as insurmountable – there’s always a way to get around them. Adams’ ingenuity burns bright in Cusack’s eyes and her physicality. Even when she goes exaggeratedly weak in the knees upon meeting Lictenburg’s foreign minister, Cosmo Constantine (Ben Davis), for the first time, she does not seem to have lost control of the situation. She’s just recalibrating. Davis sings beautifully, but the character is mostly unremarkable. There is little conflict between Cosmo and Sally, and even when some minor problems arise, they are immediately dissipated by dialogue in which one or both of them reveal that it’s not going to be an issue after all. The stakes are basement-level-low, but Davis still creates a warmth that makes Sally’s attraction to Cosmo believable. Lauren Worsham plays a sheltered Lichtenburg princess and utilizes the daffiness of the writing to achieve a character that is so disconnected by virtue of her privilege that it is a detriment to her well-being and growth. Worsham and her love interest, an American attaché played by Jason Gotay, lack the spark of chemistry, but they individually bring a great amount of charm to their roles. Gotay’s counterpoint duet with Cusack, “You’re Just in Love” is the production’s stand-out moment. Encores! often presents musicals that have very little substance and that’s fine when they conjure up a wave of joy through spectacular choreography, a delightful score, or unforgettable comedy. With this revival of Call Me Madam, the thinness of plot added to the lack of contemporary relevance added to a central performance that doesn’t quite reach its goal results in a production that passes without offense, but doesn’t whip up enthusiasm beyond that. Carmen Cusack needs material that plays to her strengths and Call Me Madam needs a star that plays to its. When neither happens, both come off empty-handed. Lane Williamson is a theatre writer and editor in New York City.